Ok, so i recently bought a 1992 subaru legacy sport with a 5 speed. It runs and drives, but not smoothly. I am getting error codes 42 and 35. Tps (which i just replaced) and i assume mas. My symptoms are.... car idles at 1500 when warm and barly idles at 500 when cold. I need to constantly pulse the throttle to keep it running until it gets warm, and even then it wont idle untill i have driven it at least 5 minuts. I also only get about 10-14 mpg (i know, American db). For this i am referencing the picture with the circle. When that hose is un kinked, the engine idles at 2500 to 3k, and when the throttle is blipped it will stay at the engine speed it topped at. When kinked i get said symptoms. Other symptoms include the engine cutting off sometimes when i hit boost, and the clutch not grabbing well. On that sub topic, the clutch is new. When i try to shift into reverse right after pressing the clutch it grinds heavily. Also while driving normally, with the clutch fully depressed it will grind untill fifth. Another thing i have noticed is that there are a few broken things. I am not a mechanic but i know my way around a wrench. 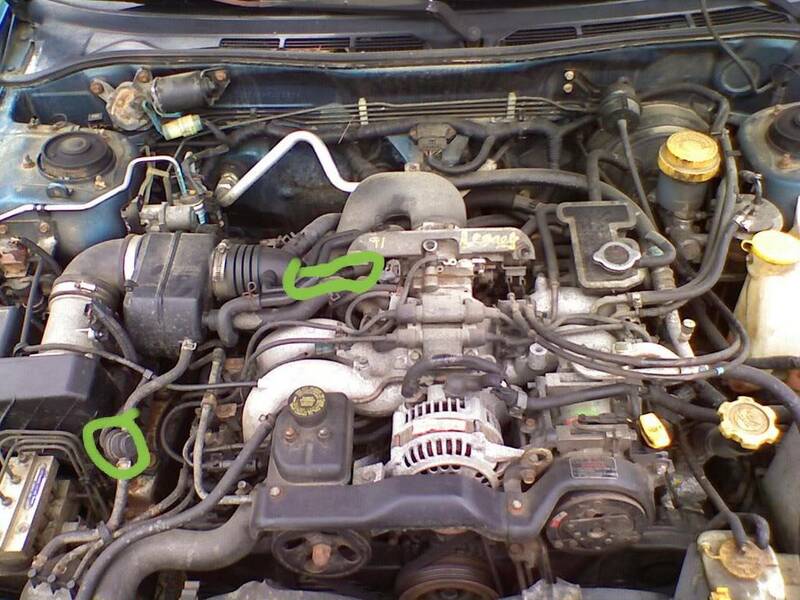 The picture with the newer engine bay (green) will have all of the things that are broken or jerry rigged circled. Oh great hive mind of the internet, share your infinate knowledge with me! Ps, when the hose is fully kinked it idles at a normal 750 rpm. Oh, and here's a better pic of the bay. The low idle when cold sounds like a coolant temp sensor. Start with that, easy to test. There's one for the gauge and one for the ECU, you'll want to test/replace the latter (2-wire). Why is/are you kinking the hose going to the idle air control valve? That would likely explain why the idle is poor. When the hose is not kinked at all, the engine will start, idle at 2k, and stay where it was reved to. If i didnt kink it, i would have multiple issues on the road. Ill try to check/replace it when i get payed next. I kind of spent all of my money on car parts when i bought it. In my opinion you are trying to fix a symptom rather than a cause. In troubleshooting you need to fix the root cause of the problem. Subaru did not intend for the IAC hose to be kinked. If I'm understanding you, if the hose is not kinked the idle stays at 2,000 rpm. What other issues do you have? Have you tried unplugging the electrical connector from the IAC valve to see if the behavior is different or if the idle stays at 2,000 rpm? Kind if. I unplugged the batt and un kinked the hose. But it was only unplugged for a max of 15 minuts. All of the symptoms should be listed in the post. Your post is not clear, which is I asked the question about the issues/symptoms occurring when the hose is not kinked. Do these symptoms occur with the IAC hose kinked or not kinked? My symptoms are.... car idles at 1500 when warm and barly idles at 500 when cold. 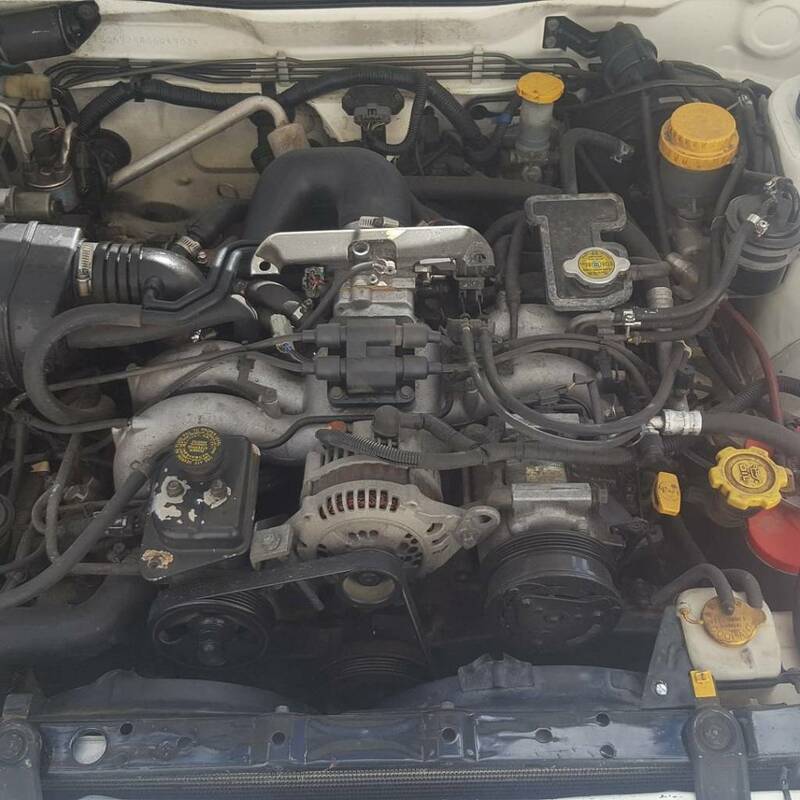 I need to constantly pulse the throttle to keep it running until it gets warm, and even then it wont idle untill i have driven it at least 5 minuts. I also only get about 10-14 mpg (i know, American db). For this i am referencing the picture with the circle. Same question about these symptoms. Other symptoms include the engine cutting off sometimes when i hit boost, and the clutch not grabbing well. It sounds like your idle air control valve is stuck open or malfunctioning in some way. These happen when the hose is kinked. It is un drivable when it is un kinked. Have you tried unplugging the electrical connector from the IAC valve to see if the behavior is different or if the idle stays at 2,000 rpm? No, i havent thought of unplugging the iacv yet. Ill try.